The entire Sweetwater Union High School District applauds and celebrates Armando Leon, U.S. History and AVID teacher at Mar Vista Academy for being named one of the five 2015 San Diego County Teachers of the Year. 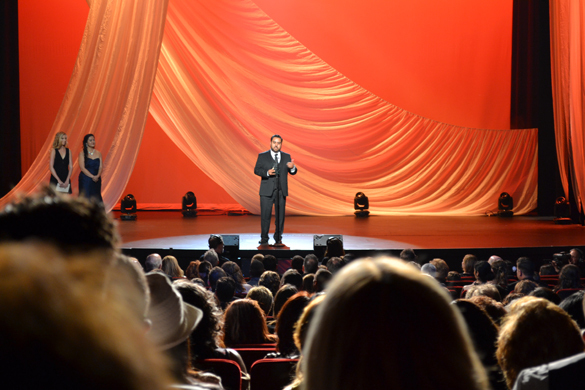 The 25th Annual Salute to Teachers event presented 44 school district nominees for San Diego County Teacher of the Year in an Academy Awards-style television event on October 10, 2015. Including Leon, the four other nominees from SUHSD were: Laurie Baker-Worthington of Hilltop Middle School, Blakeslee Detisch of Montgomery Middle School, Diane Ince of Castle Park Middle School and Gale Marshburn of San Ysidro High School. The 44 nominees represented 26,000 San Diego County teachers. Each year ten finalists are chosen during the two-hour program which culminates in the announcement of the five teachers chosen to represent San Diego County for 2015. This tribute to teachers and the incredible work they do on behalf of children is like none other in the nation. During the program, the nominees shared their passion, innovation, and heartfelt commitment to students and learning. Leon will represent San Diego County throughout the 2015-2016 school year as a County Teacher of the Year and will also be in the running for a spot as a California State Teacher of the Year.